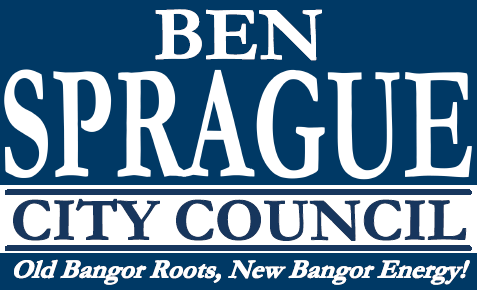 I am happy to announce my candidacy for the Bangor City Council. I was born and raised in Bangor and I am running to bring new ideas and new energy to City Hall. Bangor has a lot going for it, but we also have some very real economic issues that we need to address. If elected, I will work every single day to move Bangor from a service-based economy to a growth-oriented economy. I will also seek to develop a comprehensive and robust "Bangor Brand" so that we can more proactively market our many assets in order to attract interest and spending from away. We need to do whatever is necessary to encourage families and businesses to put down roots here. Bangor can and should be the economic, social, and cultural gem of the northeast. Please take some time to read about what I stand for and please stay in touch so I can know what issues are important to you. If you would like to volunteer for the campaign, donate, or if you have any questions, please email me at ben@benforbangor.com or call 852-1405. Thank you for your support!